Thursday morning, 5:45 am, something woke me up. I couldn’t figure out at first what it was. So I followed the melody downstairs. It was Olivia. She was dressed for school, right down to her coat and her backpack, dancing across the living room and singing one of her favorite Disney “Frozen” songs at the top of her lungs. (And completely on key, btw). 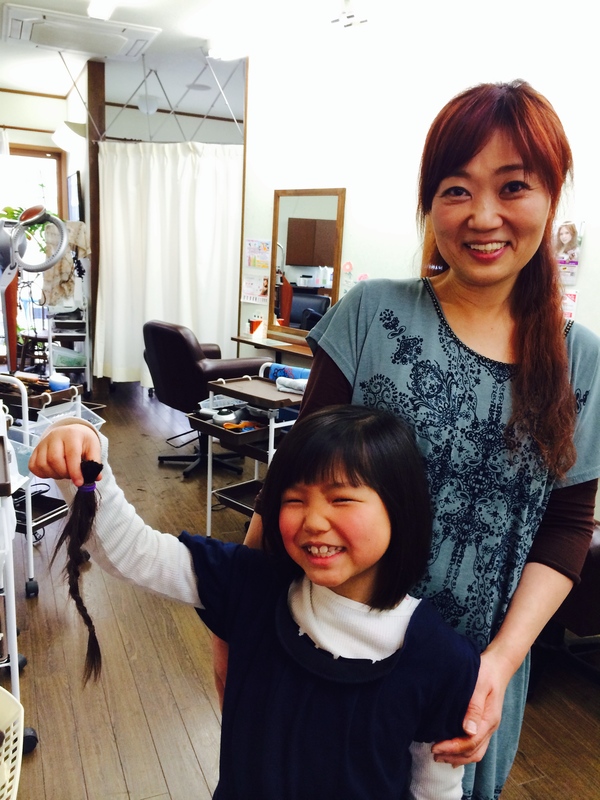 Yesterday, she got her hair wish – and early eighth birthday gift. I took her to the salon and she got her hair cut – really cut! 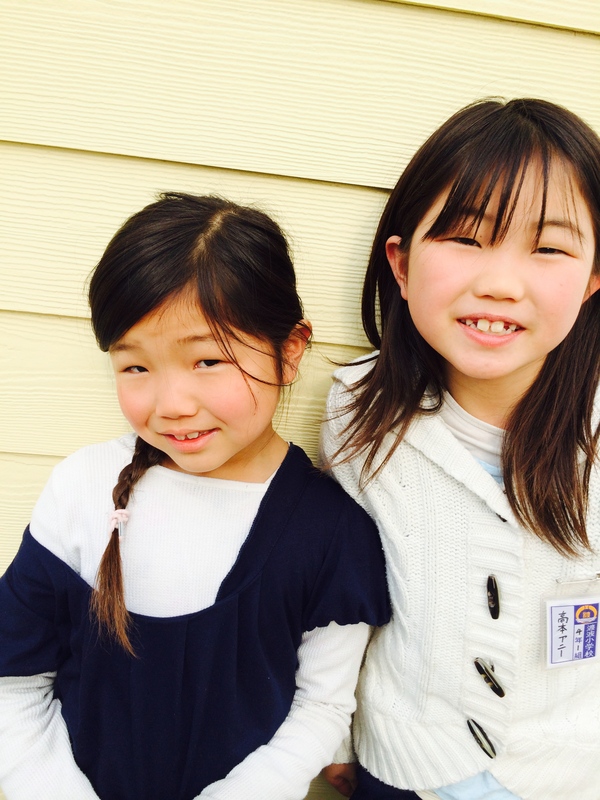 She is excited to send her ten-inch cut braid to Locks of Love to become a wig for a needy child. And she got a darling haircut! And it is funny how many people in the last 24 hours have said how much she looks like Annie. Today we celebrated her eighth birthday. Of course, we had do a Frozen theme! 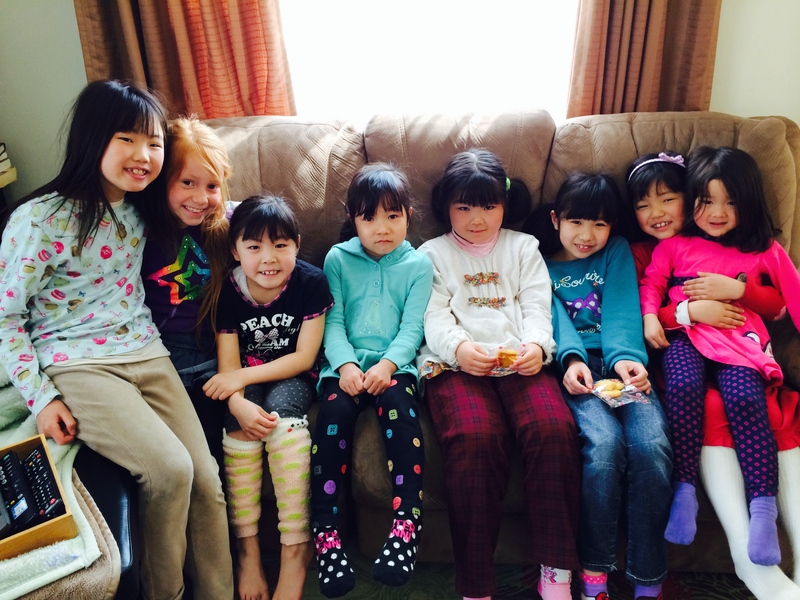 We invited three of her classmates and their moms who work with me at Nozomi, and then the females from our Be One team. 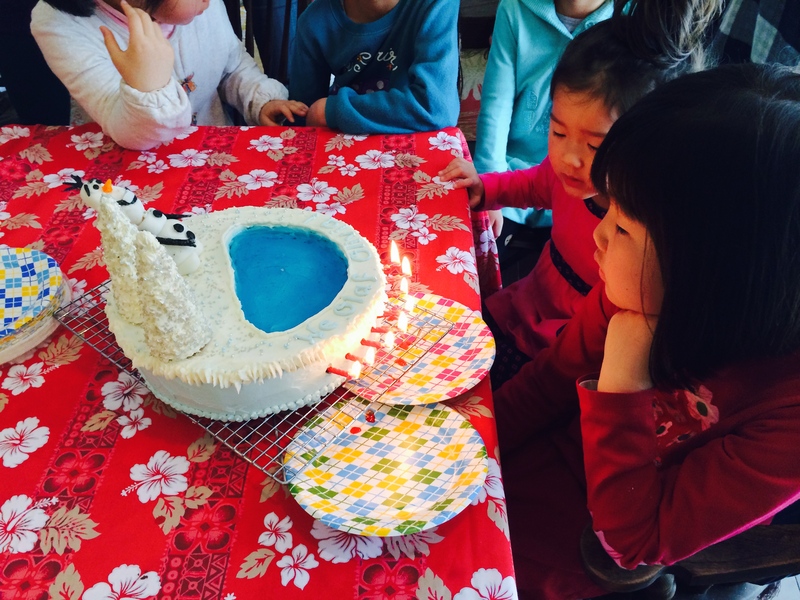 Because I do all my cake-making in Japan, I’ve never really worked with fondant (except for my Thomas train wreck). I found a company where I could order it, and so I had fun last night making Olaf, the cute-as-a-button snowman in the Frozen movie. The tress were Baskin Robbins ice cream cones… the pond came from my last box of blueberry jello. The most challenging part was the black parts of Olaf – I tried to paint on the color which made it sticky and left black stains that I had to try and get rid of on Olaf’s white body. I learn stuff every time I make a cake! It was really fun. I was thankful for Eric, who cooked a beejiba bunch of food on the grill; and for our team who helped me so much when my back was pretty bad today. Yes- it can be! God has blessed us with a table full of olive shoots! Olivia is a beautiful, daily reminder of the amazing God who keeps His promises. You are such a creative cake maker,, but so much more…you are an amazing inspiration to so many…me included. Thank you for your willingness to share your story (stories) both the sweet moments and those more challenging. God’s richest blessings be yours…and on your entire table of “olive shoots”. 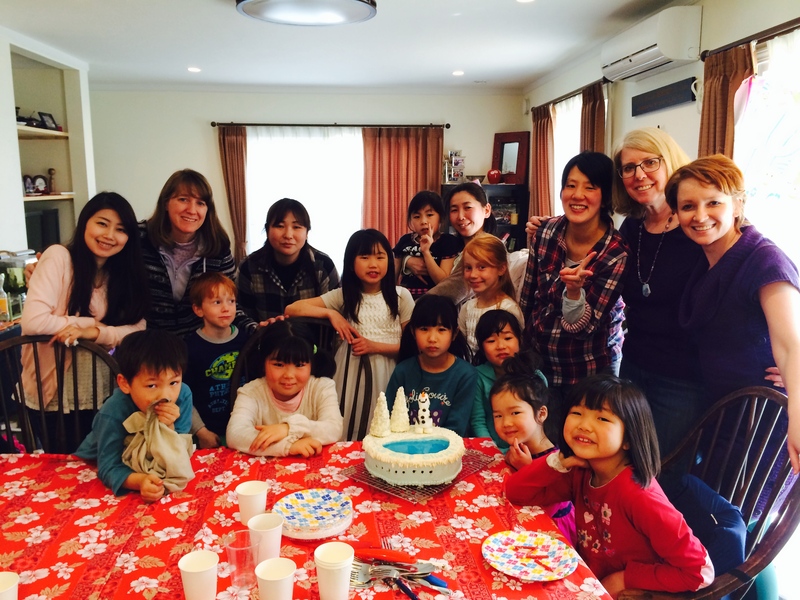 Happy Birthday dear Olivia! 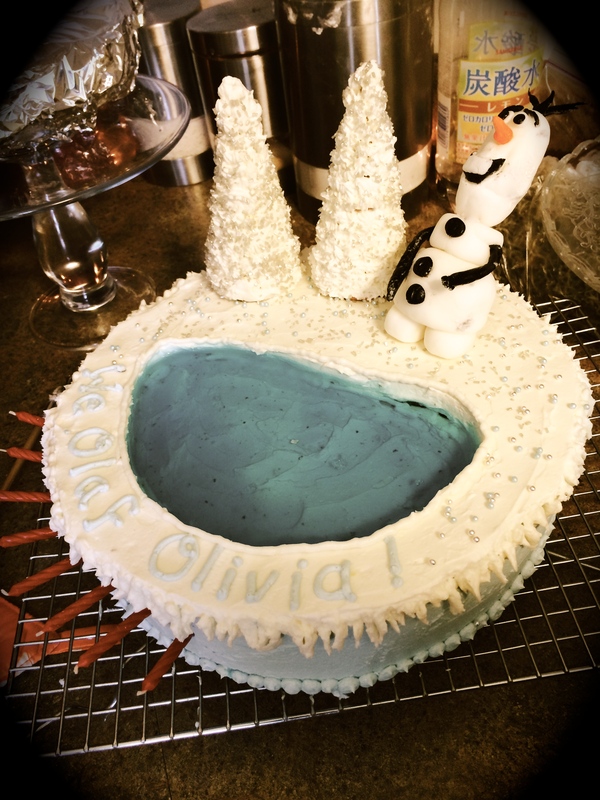 what an amazing Olaf cake your mommy made! thankful that God gave you to your daddy and mommy – you are a blessing to them and they are to you!! Happy Birthday, Olivia! It finally dawned on me how you got your name–you’re one of the olive shoots of Psalm 128 which I read tonight! It’s wonderful how at such a young age you are already excited about helping people (I donated my hair for the second time last year, and Lord willing, I may again, if I don’t get more than 5% gray!). Nice haircut, by the way ( 🙂 You are so richly blessed!